There's a manhunt going on in Colorado for a female runner who's run amok. She's number one in the Colorado Springs police blotter for going number two. Yes, we've all been there. You're in the middle of a long run...perhaps on an out-and-back and the urge hits for the shits. I've had two close encounters with number two. Once along a stretch in my old neighborhood without a porto-potty within miles. There is a tree that I can never look at the same way ever again. The second time was documented in my "A Run with Runs is No Fun" POST, but I made it to the safe confines of a Pizza Hut. The "mad pooper" as she's been labeled by neighbors in Colorado Springs is a professional outdoor pooper. She travels with paper towels and has been caught not once but twice doing number two just outside the Budde family home. The first time, Mrs. Budde's children caught the woman "in the act" with run pants dropped. Understandably, the kids ran into the house screaming. Imagine their dreams that night. If you aren't shocked enough, there is a park with bathrooms across the street and a nearby gas station...ahem...she's beyond gas. 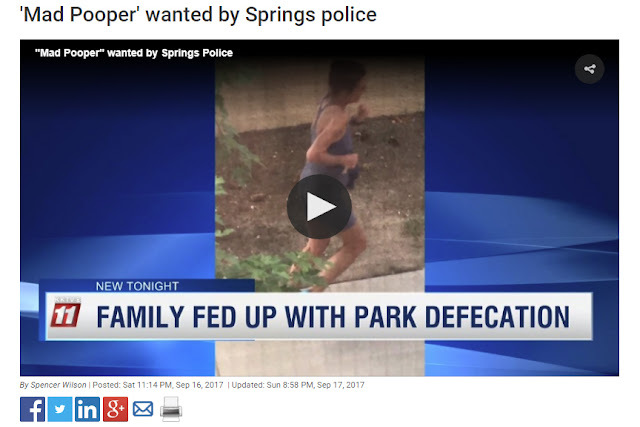 The Colorado Springs "po-po" are looking for the lady known for poo-poo. Please don't judge Colorado by one bad actor. Most of us have more discipline with our rituals. If you can help identify this woman, you can get in touch with the Falcon division of the Colorado Springs Police Department at 719-444-7240.